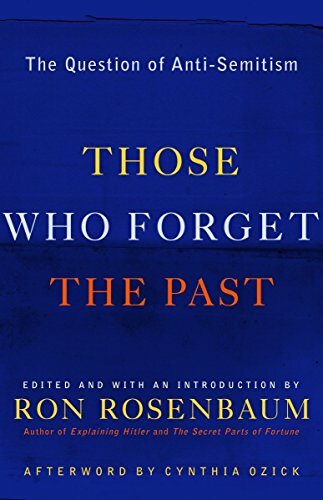 [PDF] Those Who Forget the Past: The Question of Anti-Semitism | Free eBooks Download - EBOOKEE! Description: Something has changed. After the horrors of World War II, people everywhere believed that it could never happen again, but today the evidence is unmistakable that anti-Semitism is dramatically on the rise once more. The torching of European synagogues, suicide terror in Israel, the relentless comparison of the Israelis to Nazis, the paranoid postâ€“September 11 Internet-bred conspiracy theories, the Holocaust-denial literature spreading throughout the Arab world, the calumny and violence erupting on American college campuses: Suddenly, a new anti-Semitism has become widespread, even acceptable to some. In this chilling and important new book, Ron Rosenbaum, author of the highly praised Explaining Hitler, brings together a collection of powerful essays about the origin and nature of the new anti-Semitism. Paul Berman, Marie Brenner, David Brooks, Harold Evans, Todd Gitlin, Jeffrey Goldberg, Bernard Lewis, David Mamet, Amos Oz, Cynthia Ozick, Frank Rich, Jonathan Rosen, Edward Said, Judith Shulevitz, Lawrence Summers, Jeffrey Toobin, and Robert Wistrich are among the distinguished writers and intellectuals who grapple with painful questions: Why now? What isâ€”or isnâ€™tâ€”new? Is a second Holocaust possible, this time in the Middle East? How does anti-Semitism differ from anti-Zionism? These are issues too dangerous to ignore, too pressing to deny. Those Who Forget the Past is an essential volume for understanding the new bigotry of the twenty-first century. No comments for "[PDF] Those Who Forget the Past: The Question of Anti-Semitism".